Defense News reports the Navy marked a milestone Friday for the ship named after the famously ornery and uncompromising father of the nuclear-powered Navy, Hymen G. Rickover, as the Navy burns its way through the latest iteration of the Virginia-class attack submarine. 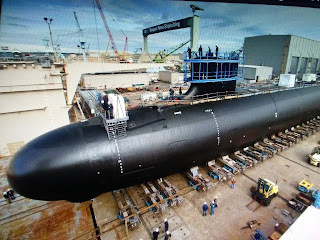 At a ceremony at General Dynamics Electric Boat in Connecticut, the Navy celebrated the laying down of Rickover's keel. "Adm. Rickover’s gift to our Nation’s defense — safe, reliable, and militarily superior naval nuclear propulsion — is as vital to our warfighting edge today as it was at the beginning of the Naval Nuclear Propulsion Program 70 years ago," said Naval Reactors head Adm. Frank Caldwell, who now holds Rickover's old job. "The U.S. Navy and our nation are proud to honor his achievements and legacy with this submarine."